Help Runner Runner and Vote Today! Performances include a very special ‘So Obvious’, ‘Hate The Way’, & ‘Hey Alli’. Click here to watch all three performance, then don’t forget to vote here. Attention all football fans! We will be playing a pre-game performance party in the parking lot of Gillette Stadium on OPENING DAY, Sunday Sept. 12th for the New England Patriots! 92 PRO-FM & Capitol Records have you covered with two tickets to the event, which also gets you into the BIG GAME! Come watch Runner Runner at the stadium and then stick around as we watch the Pats take on the Bengals. It’s guaranteed to be a great time so enter today for your chance to win! Click here to enter to win 2 FREE tickets to see Runner Runner perform opening day at Gillette Stadium and then watch The New England Patriots take on The Cincinnati Bengals! JOIN CAPITOL’S RUNNER RUNNER STREET TEAM & EARN REWARDS! We need your help everyone. Use the code below to embed our widget on your site and give your friend, family, and visitors the chance to win 2 FREE tickets to the BET awards in Los Angeles, CA courtesy of Capitol Records and yours truly. Two things to tell everyone about today. Okay so first of all we are running a very special contest with Cosmo Girl! Not only do you get a copy of the record, but you will also win a poster and a brand new T-shirt! Way cool. 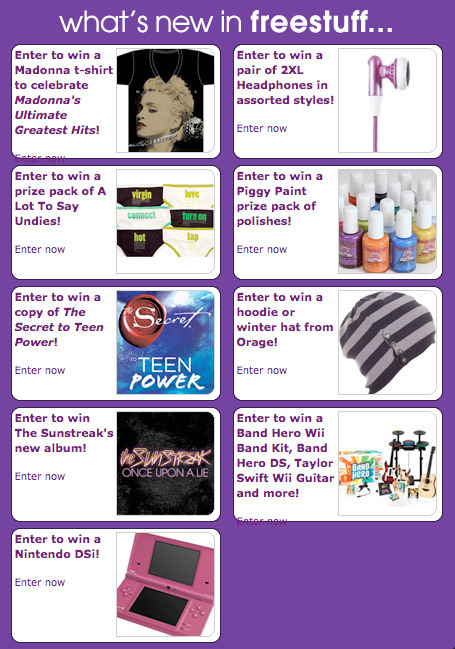 Plus….. there are a ton of other great contests running right now on CosmoGirl.com that are free to enter. That Madonna shirt and Nintendo DS caught our eye! Next on our list is a big THANK YOU to cosmo girl for posting an article about us on their blog The Daily Kiss! Remember that awesome video of the Canton South Band performing “Unitl I Met You?” Well Cosmo Girl thought it was awesome and posted about it! New Sunstreak Contest – We Will Play Your House! You can become the Ultimate Streaker and you don’t even have to take your clothes off or leave the house! Create a Fan Group for The Sunstreak on Facebook. One lucky winner with the largest Facebook Group will be rewarded with a private concert in their hometown! Prizes will be awarded based on the number of fans you get to join your group. In addition, there will be a grand prize at the end of the contest, ending September 21, awarded to the fan with the largest Facebook Fan Group. Get all your friends out to join the Streakers and help you win your own private show! Happy Streaking! Originally posted on TheaterMania.com, click here to view the original post. Sebastian Bach and Tony Award nominee Constantine Maroulis (Rock of Ages) will be among the celebrity judges for the Independent Film Channel’s America’s Hottest Rocker Mom Contest, to be held in Madison Square Park on June 3 at Noon. The event is being presented in celebration of the second season of IFC’s comedy Z Rock. Judges will also include Bethenny Frankel (Real Housewives of New York City) and Z Rock cast members Paulie, David and Joey. The event will feature finalists Natalie Hawkins (Conroe, TX), Shawna Owens (Cadillac, MI), Debra Diamant (Los Angeles, CA), Kat Everson (Beverly Hills, CA), and Valerie Nerres (Las Vegas, NV) competing in the following categories: Attire: Best Rocker Outfit; Knowledge: Rocker Trivia; Dance: Show Off Your Best Moves; and Lyrics: Rock Karaoke Contest.